Style and grace come together with ease in this art deco ring from Apples of Gold. A 6mm garnet stone offers an intense red color that quickly captures your eye. Set in a contrasting yellow gold, the effect is alluring. 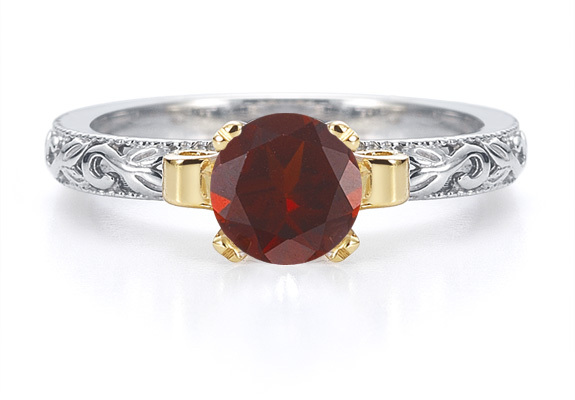 The yellow gold setting also allows the garnet to sit well above the band to fully capture the light. Art deco scrollwork makes a solid appearance on the white gold band, with perfectly coiled swirls and precision that makes this two-tone ring truly gorgeous. We guarantee our 1 Carat Art Deco Garnet Engagement Ring to be high quality, authentic jewelry, as described above.